Medallion Made from Copper Recovered from Mission "Santa Clara de Asís"
This medal was struck specifically for "La Fiesta de Las Rosas," a festival that was to be held in San Jose to commemorate the city's Spanish heritage as associated with the Bicentennial. Unfortunately for the organizers of the festival who had the medals struck, local groups objected to the Spanish heritage aspects of the festival, as they felt it ignored the city's Mexican heritage. The result was the festival was canceled and the medallions sat in storage for the next 30 years. The front of the medal shows a horse-mounted Portolá and walking Father Serra, with a rose in the foreground. It also contains "La Fiesta de Las Rosas", the dates of the Bicentennial (1769-1969), and "Portola Expedition". The reverse contains a portrait of the state of California, and state "This coin contains copper left by early Spanish expedition, found on old missions grounds, Santa Clara." Made of copper, the medallion is an inch and a quarter in diameter. A popular legend, the story became part of American popular culture as early as the 1830s, becoming famous during the centennial year of 1876, with the publication of a fictitious "eye-witness" journal, The Diary of Dorothy Dudley. The tree itself was indeed real and stood in the middle of Garden Street at the intersection of Mason Street in Cambridge, Massachusetts. 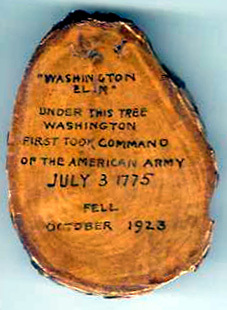 Washington did take command of the army in Cambridge on July 3, 1775, but there is no documentation to indicate that the event took place under the elm tree. Washington established his New England headquarters at the Vassal House on Brattle Street (now better known as the Longfellow House), where he resided until April 1776. The myth of Washington and the elm is still widely known today, and the image of the tree remains a symbol of patriotism in Cambridge. Workers had been removing branches to ease the strain on the ailing tree (whose trunk had rotted into “a mere mass of punk,” in the words of a later historian) when they tugged too hard and accidentally knocked the whole tree down. Local residents swarmed over the site to gather souvenirs, but enough wood was salvaged to fashion into more than a thousand assorted tokens and relics, including gavels for the legislatures of all forty-eight states. A botanist estimated the tree’s age at 210, meaning that it had been around 60 in Washington’s day. A plaque embedded in the street's pavement marks the original location of the tree. However in 1925, Samuel Batchelder, a Harvard University professor, cast serious doubt on the story that had made the tree’s reputation. He combed through records, letters, and diaries from 1775 and found no mention of any such event. In any case, he wrote, there would have been no reason for Washington and Artemas Ward, the general he was replacing, to leave their headquarters and stand beneath a tree simply to hand over the order book and conduct a few other formalities. And with the whole Boston area in peril less than three weeks after Bunker Hill, no one had time for elaborate ceremonies. Washington was much more concerned with inspecting his troops and reconnoitering the enemy, who were rumored to be preparing an attack. According to Batchelder, Washington may well have stood under the elm sometime around July 3 and reviewed the few regiments stationed in Cambridge, to the usual accompaniment of fife and drum. But no grand ceremony took place, and the actual transfer of command was a perfunctory bureaucratic event that doubtless took place indoors. Modern historians tend to downplay or dismiss the Washington Elm tradition. The Thames River bisects the city of London, and has had several bridges cross its span over the centuries. None, however, are quite as memorable as the London Bridge of 1831 to 1968. On June 15, 1825, the Lord Mayor of London, John Garrett, laid the first stone. However, this bridge was not to survive as long as earlier bridges, and plans were afoot in the 1960's to replace the structure by a modern bridge. The bridge had sunk twelve inches at the southern end even on completion and had continued to sink unevenly by an inch in every eight years thereafter and could no longer cope with the extent of modern traffic. Meanwhile, in the United States, Robert McCulloch, a real estate developer, learned that the British Government was putting the bridge up for sale. He put in the winning bid for $2,460,000 in 1968, and plans were drawn up to move and rebuild the bridge in Lake Havasu City, Arizona. McCulloch spent another $7 million to move the London Bridge to Lake Havasu City which took a total of three years. Each piece was marked with four numbers. The first indicated which span, the second noted which row of stones, and the last two numbers indicated which position in that row. It was discovered, while dismantling the bridge, that there were code numbers on each stone when it was originally built: John Rennie must have used the same system when the sections left the quarries. The reassembly of the bridge in Arizona was completed on October 10, 1971, and it remains in use in Lake Havasu City to this day. Parts of the bridge were removed and sold as collectibles, such as this paperweight. It included a small plaque, stating "Authentic piece of the London Bridge" and bears the signature of Harold K. King, the city engineer for the Corporation of London. The Spring of 1836 saw several pivotal moments in Texas history. On March 2nd, delegates at Washington-on-the-Brazos signed the Texas Declaration of Independence and the Republic of Texas was born. On March 6th, the Alamo fell to overwhelming Mexican forces after a thirteen day siege. And, on March 27th, Colonel Fannin and 344 of his men were massacred at Goliad. These twin disasters sparked a mass exodus of Anglo settlers towards the Louisiana border in what is known as the Runaway Scrape. General Sam Houston, too, withdrew east as the larger Mexican army under the "Napoleon of the West" -- General Antonio Lopez de Santa Anna -- advanced deeper into Texas. On April 17th, Gen. Houston's army reached a fork in the road. One road led to Louisiana and refuge in the United States; the other led to Harrisburg and the Mexican Army. Houston signaled his men to march toward Harrisburg, sparking cheers and applause. His men -- poorly trained and equipped, but feisty and determined -- numbered only 900 men; Santa Anna's troops -- highly trained but overextended -- totaled over 1300 men. At 4:30 p.m. on April 21st, Sam Houston ordered the attack. Mexican soldiers were roused from their siestas to the smell of gunpowder and the cries of vengeance: "Remember the Alamo!" "Remember Goliad!" In eighteen minutes the battle was over, and Texas had won its independence. Over 600 Mexican soldiers were killed and 700+ allowed to surrender; only nine Texans were killed or mortally wounded. Sam Houston was wounded in the ankle, while Santa Anna was found the next day hiding in some tall grass, dressed as a common foot soldier. The defeated "Napoleon of the West" soon signed treaties ceasing all hostilities, recognizing an independent Republic of Texas, and establishing the Texas-Mexico boundary at the Rio Grande River. Construction of the monument to the battle began during the Texas Centennial celebrations in 1936 and lasted three years. It was designed by architect Alfred C. Finn, engineer Robert J. Cummins, and Jesse H. Jones. Its builder was the Warren S. Bellows Construction Company of Dallas and Houston. At 570 feet, this Texas giant is 15 feet taller than the Washington Monument and is one of the finest examples of Moderne (Art Deco) architecture in the United States. The monument has been recognized as a National Historic Civil Engineering Landmark by the American Society of Civil Engineers. The base is 125 feet square, with text panels highlighting significant events in history leading up to and resulting from the Texas Revolution. The shaft itself is octagonal, 48 feet at its base, 30 feet at the observation level and 19 square feet at the base of its crowning jewel—a 220-ton star made from stone, steel and concrete. It is the world’s tallest memorial column. In 1995, the Texas Parks and Wildlife Department began renovations of the monument's iron and limestone exterior and commissioned a company to make souvenirs from the salvaged materials, mostly fossiliferous "shell" limestone. This is one of those items. This paperweight is in the shape of Texas and measures approximately 3" by 3". It is composed of Texas fossilized buff limestone quarried near the state Capitol at Austin. 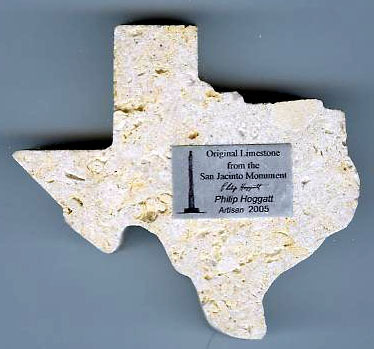 It has a polished metal plaque affixed to it that reads, "Original Limestone from the San Jacinto Monument" plus the name of the artisan, Philip Hoggatt, and the date 2005. 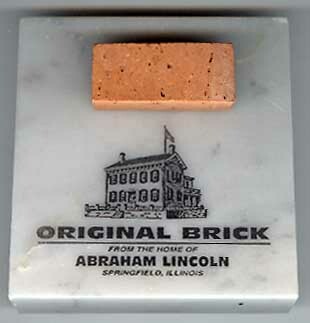 A miniature brick cut from Abe Lincoln's home at 8th and Jackson in Springfield, Illinois. The first home Abraham and Mary Todd Lincoln owned, it was purchased after he became a lawyer as a one-and-a-half story cottage with six rooms, and was enlarged in 1855-56 to two stories with twelve rooms. The site of numerous important events in Lincoln's life, such as the births of three of the couple's sons, his home while he served in the U.S. House of Representatives, and where has lived during his 1860 bid at the presidency. In 1954, the state government of Illinois had repair work done on the Lincoln home, the contractor removed the broken bricks and a local jeweler cut them into mini bricks, which were sold to the public. The size of the mini-brick is 1 1/2" by 1/2" by 1/2", mounted on an engraved marble paperweight that is 3"x3"x 1/2". The back has a copy of authenticity attached, and each brick paperweight comes with a short history of the bricks from 1954 to 2001.